It may seem like a coincidence that during the recent Festival of Light I was driving on the Maju Expressway at night to attend an open house. What struck me is that the expressway is lit up all along the stretch and wondered if Tan Sri Abu Sahid would light up all the PLUS highways if he gets to purchase PLUS. Over the past couple of months I have been reading about the proposed purchase of PLUS by Maju Holdings from Khazanah and EPF. Several people have written on it while I waited a bit to read up on the interviews given by Tan Sri Abu Sahid himself. While other toll concessionaires strive to increase toll rates to keep up with ever-increasing OPEX, one of Tan Sri Abu Sahid’s selling points is to NOT increase toll rates until the concession agreement that was signed during Mahathir’s administration expires in 2038, and while many think Tan Sri Abu Sahid is mad, I see method in his madness. The first question raised by many including myself was where is Maju Holdings going to raise the kind of money needed to buy PLUS from Khazanah and EPF? Tan Sri Abu Sahid revealed that he is getting financial backing from Evercore, an independent investment banking advisory firm and a boutique investment bank. Evercore is involved in many toll road projects around the world, and has crunched the numbers to support Abu Sahid’s claim that he could run the PLUS highways at a profit without having to increase the toll rates until the expiry of the concession. So far, all the “experts” that have spoken against Abu Sahid’s claim have not shown any credible evidence to support their opposition to Abu Sahid’s proposal. They counter Abu Sahid’s proposal by saying that it is not viable and may increase risks to users, without any figures to back them up. But Abu Sahid has already shown that currently PLUS is paying about RM58 per square metre for resurfacing works, compared to just RM18 per square metre done by MEX. And those figures are based on both operators using the same contractors for the works. How is it that PLUS is paying RM40 more per square metre compared to MEX using the same contractors? Neither EPF nor UEM have offered any explanation to say otherwise, let alone sue Abu Sahid if the latter had gotten his facts wrong. “The best thing for them (UEM and EPF) to do is to sell PLUS. I pay them RM4 billion in hard cash, and you have taken back whatever you invested, so it’s already free, their IRR (internal rate of return) is 20 percent. If they say it’s not enough, how much do they want? Show me how much they make on their investments,” said Abu Sahid to reporters in a recent press conference. Abu Sahid also seeks to forfeit the government’s compensation of about RM900 million owed to the toll road operator, which arose as a result of toll hikes not being implemented. Imagine what the government could do by chanelling this money to sectors that badly need such funds. In an interview, Dr Mohamad Shazli Fathi who is the Deputy Director at Universiti Teknologi Malaysia’s Environmental and Occupational Safety and Health Unit said that by not increasing the toll for the next 20 years will only endanger highway users. Citing the ever-increasing cost of maintenance, especially for bitumen and cement, Dr Mohamad Shazli is skeptical of Abu Sahid’s offer. Again, Dr Mohamad Shazli was just shooting from his hip without any figures or projections to back his claim, as with the other experts sought to “help explain” matters. What these experts forget is that Abu Sahid could obtain these materials in bulk, thus reducing costs, through Ipmuda Berhad where he holds 31.23 percent equity interest. And if he can do resurfacing for the 26-kilometer MEX at RM18 per square metre, it should be far cheaper, if not the same, for 974 kilometers of highways owned by PLUS through its various operating companies, because of economies of scale. In fact, as the owner of MEX, Maju Holdings had had the expressway lit up as an extra safety measure for drivers and users, all 26 kilometers, and plans to do the same for all 974 kilometers of expressway under PLUS. No longer are drivers required to strain their eyes in the dark, or feel scared if they suffer a breakdown at night. If this is not safer than what the PLUS highways are now, I don’t know what is. Try driving from Kulai to the Second Link at night and you will know what I am talking about. 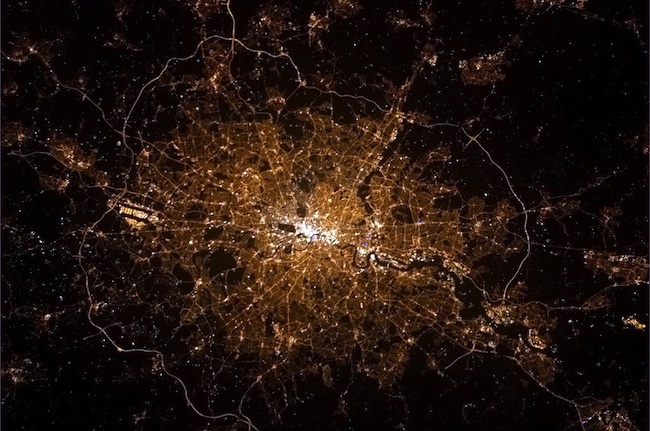 If you look at the photo above of London and the M25 motorway as taken from the International Space Station, imagine how 974 kilometers of expressways lit up at night would look like from space. That would certainly look awesome! We Have Just Sold Our Country To The Chinese, Now We Want To Surrender Our Highways To The Americans? Of course there is no such thing as selling our country to China (read ‘Apa Yang Strategiknya?‘, ‘Teka Bila Kem Tentera Mula Hendak Dijual?‘ and ‘The Living Forest‘). That is just people who are no longer politically-relevant talking to justify their miserable existence. The other question that is in the people’s mind is: if Abu Sahid defaults on his payment to Evercore, does this mean that Evercore owns the highway? Highway concessionaires only hold concessions. The highways belong to the government. What Abu Sahid is seeking is to buy PLUS the highway concessionaire from Khazanah-owned UEM and EPF. When Abu Sahid proposed to sell of MEX (a deal which eventually fell through), Mahathir was angry and said, “You sell what is yours. You don’t sell what belongs to others. It could be as bad as selling APs.” Only what is owned by MEX were allowed to be sold. The cars, the computers, the chairs, tables, tea cups. Not the highway. The term “highway” by law includes all traffic lanes, acceleration lanes, deceleration lanes, shoulders, median strips, bridges, overpasses, underpasses, interchanges, approaches, entrance and exit ramps, toll plazas, service areas, maintenance areas, highway furniture, signs and other structures and fixtures and any other areas adjacent thereto. These are under the control and management of the Highway Authority of Malaysia (Lembaga Lebuhraya Malaysia or LLM). It is because of that if Abu Sahid actually defaults on payments to Evercore, the PLUS highways will not be closed to traffic. So what does Abu Sahid want from PLUS if it does not make him much money? Access to his parcels of land so he could develop them, and provide access to land to the left and right of these highways for them to be developed. Like it or not, mad or otherwise, Abu Sahid is a patriot at heart. Just like the cheap and controlled price of food sold at his Terminal Bersepadu Selatan (TBS), Abu Sahid does not want the people to be further burdened once UEM has to service its RM30 billion principal payment that is due soon. Perwaja, the brainchild of Mahathir, was set up in 1982. Even in the initial years of operating, it continuously lost money, mainly due to the global recession, lower steel prices and softer demand for steel. Government-owned Hicom Holdings was the original major owner of Perwaja Steel with a 51% stake, which it divested in 1988. A year later, Nippon Steel of Japan gave up its 30% stake to the Malaysian government, paving the way for a major restructuring of the company. The government pumped some RM2 billion into the company, and new facilities were built in Kemaman, Terengganu, and Gurun, Kedah. Despite this and several more capital infusions by the Government, Perwaja still suffered losses. Later in 1995, the Government put Perwaja up for sale and after a delay due to the Asian Financial Crisis, Tan Sri Abu Sahid Mohamed’s Maju Holdings emerged as Perwaja’s ultimate holding company in 2003, in a deal valued at RM1.305 billion. And despite the massive losses Abu Sahid never sold his shares in Perwaja. “I promised the government I would not sell and I didn’t. I burnt RM700 million to keep my word,” he said to The Edgemarkets recently. Who Is Happy And Who Is Not? The happiest people if Abu Sahid gets to buy PLUS are the people – the users of the PLUS highways. For the next 20 years, Malaysians plying the PLUS highways would not have to worry about the increase in toll rates. This definitly augurs well for the government, especially in the savings it could make. The deal also saves EPF contributors from suffering once the massive principal payment needs to be made. The ones who do not seem to be happy are UEM (Khazanah) and the EPF, for reasons only known to them. The best part is, without passing Abu Sahid’s proposal to the investments committee where it could be studied and recommendations made, both UEM and EPF have made it clear that they are not interested to sell PLUS to Abu Sahid. How can they make such a call when the investment committee from both government institutions have not studied the proposal? Is there more to the RM58 per square metre that meets the eye? Again, only UEM (Khazanah) and the EPF can answer this, and if only they feel like answering. For the people, this is a possible plus point for the government. In the meantime, the voters wait.